Ballin' 4 Peace Celebrity Charity Basketball Tournament Returns to Corona Queens, New York on Saturday April 21st. Powered by H2obasketball, & Founder Haron Hargrave, Ballin' 4 Peace will feature an array of NYC culture favorites including, Basketball sensation Filayyyy headling the 4th Annual event, representing New Jersey with Power 105.1 EmEz, Harlem's beloved Loaded Lux and Mr. Commodore will get it cracking with Brooklyn's King of the Milly Rock, 2 Milly too! Nya Lee, is scheduled to Coach on one side with Sexxy Lexxy on the other. Other notabale celebrities include Love and Hip Hop's Yandy, Grafh & Kiyanne. Pastor Carl Lentz and Fatboy SSE will also be in the building at 107-20 Northern Blvd, Corona, New York 11368 Elmcor Youth and Adult Center. 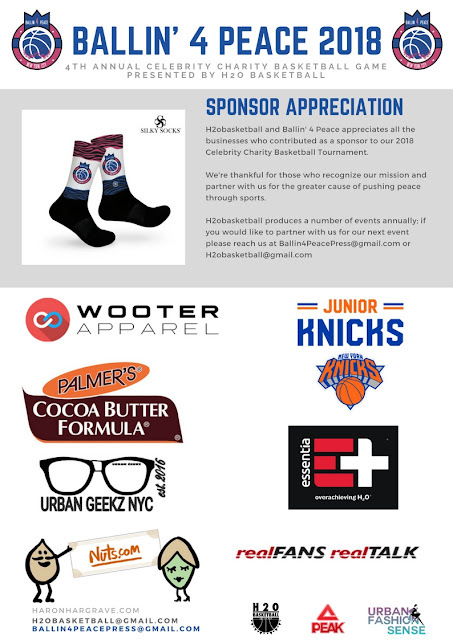 Urban Fashion Sense the Official PR Consultant for Haron Hargrave, H2obasketball, Ballin' 4 Peace and H2OMusic would like to thank our Sponsors including, Junior Knicks, Wooter Apparel, Essentia Water, Silky Socks, Palmers Cocoa Butter, Urban Geekz NYC, Real Fans Real Talk, Nuts.com & PEAK USA SPORTS.